At the 1983 NBAA convention in Dallas, Texas, Piaggio announced the birth of a new twin turbo-powered business aircraft. Design work on the P.180 Avanti had begun at Piaggio's Genoa headquarters in 1979. Seating six to 10 passengers it was a radical depsrturc from anything the company had previously produced, while utilising the experience gained from building other pusher-types such as the P.166. The major design feature of the aircraft is its use of three lifting surfaces. The main wing is fitted above the mid-set position in the fuselage, with the main spar running behind the passenger cabin. Its straight leading edge is broken only by the engine nacelle inlets and the wing has a slight dihedral of 2�. The T-tail and elevator act as the second lifting surface, in addition to being orthodox control surfaces. Theforeplane, however, is not a simple canard, but provides a positive lift component in addition to that produced by the wing. This in turn allows the wing to be reduced in size, thus decreasing overall weight and drag. 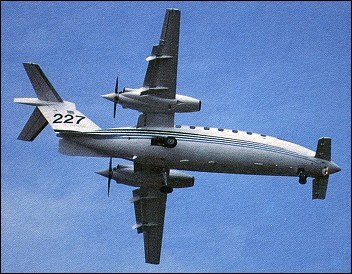 The engines were originally specified as Pratt & Whitney Canada PT6A-66A turboprops, but these were later changed in favour of more powerful PT6A-61s. Each drives a five-bladed Hartzell fully-feathering reversible-pitch propeller with spinner. The engines are mounted in composite-material nacelles. The Avanti makes considerable use of composites, if not to the same degree as the rival Beech Starship, for example. Carbonfibre and a Graphite/ Epoxy mix represent about 10% of the aircraft's weight, and all of these components are built by Sikorsky arid Edo. Wings and tail sections are produced by Piaggio at Genoa, while the forward fuselage is the responsibility of Piaggio Aviation in Wichita. Final assembly is completed in Italy. Aircraft intended for the American market are flown 'green' to the US to a specialist outfitters and there are plans to eventually assemble all aircraft in the United States. The cockpit is fitted with a Collins EFIS system, comprising three CRTs and Col-lins navigation and weather radar systems are standard. The aircraft is certified for single pilot operations. The main cabin is pressurised and air conditioned, is fitted with a galley and folda-way tables. An emergency exit is situated at the front on the starboard side with the airstairs on the port side. In 1983 Gates Learjet became a partner in the project, but withdrew for economic reasons in January 1986. All the tooling and the forward fuselages of the three pre-production Avantis which were on the line at Wichita, were then transferred to Italy. Assembly of the first P.180 began on Piaggio's Finale Ligne plant in 1986 and the first flight was made on 23 September 1986 (I-PJAV). This was followed by the second aircraft (I-PJAR) on 14 May 1987. The Avanti was certified by the Italian authorities in March 1990, and in May of that year the first production aircraft was rolled out. The final hurdle of US certification was passed in October 1990 and the first customer delivery took place the following September. By early 1993, despite or perhaps because of its radical appearance and advanced design, only 20 Avantis had been delivered. I was a P180 pilot. Its maximum TAS is actually 398 Knots, and the only real emergency to face is the smoke in the cockpit. On single engine operation and with all anti ice equipments working it has a ceiling of more than 20000'. It can make a steep approach with an 8% slope. It is almost impossible to stall it. It has no anti/de-ice equipment on the tail since it can fly without problems with an ice accretion of more than 5 inches. It has no ice protection for the propeller blades since the exhaust gases prevent ice formation. The only issue is taxying. Sorry but this aircraft does seem to be a bit of a mess. What is the reason for a canard if you also have a tail elevator? There are fins all over the place. I think that slightly swept wings with rudders at their ends would have given enough directional stability without the tailplane and would have simplified production. I did see one at the 2004 Fairford air show. 203 delivered to September 2010, not bad. I am unaware of the engines ever having been PT6A-61s. Originally, used PT6A-66's, then changed to PT6B-66's, if I recall the engine designation correctly. The speeds quoted above are WAY off. Cruise is around 380 knots, with a maximum of 402 knots (about 460 MPH or 700 KPH). However, I have records of Avantis flying at speeds in excess of the rated maximums--A Mr. Ritchie flew his (with 9 pax aboard) at an average speed of over 570 MPH in 2004. That was a three-legged trip, in three different directions, so the probability that he "had a good tailwind" is extremely unlikely. The plan really IS that fast! I flew in one of these aircraft last year (May 2009) as a passenger from the Italian Air Force base Amendola to the ITAF Base at Decimomannu and back again. It was a smooth and comfortable ride. VERY STRANGE DESIGN HAS THIS ITALIAN AIRPLANE ! The design is very mindful of the AvTech 400 so named because of its designed speed. It was among the first attempts at an all composite aircraft of canard design with twin Pratt-Whitney PT6A's. It was developed in Camarillo California between 1981 and 1985 and successfully flown but as with many private sector attempts short fall of capital spelled this promising craft its doom. How many are made and what does one cost? And where can you buy them? Have there been many accidents or crashes? I would like to know more about this plane as it reminds me of a Rutan design which i like very much.